I am writing from Kauai, HI, while on a vacation, bracing myself for grading students’ term papers next week. Before humans discovered fossil fuels, it would not have been possible for me to fly here in a matter of hours, have the use of a car to explore this lovely island, and to reach its most remote beaches and hiking trails. You may say that a vacation is a frivolous purpose for which to use fossil fuels. It is not—if human life is the standard of value. The mobility that fossil fuels enable is important for being able to leave work behind and truly to be able to rest and relax—so that we can be fully productive again when we return. But it is not only mobility, for vacations and other purposes, that fossil fuels give us. 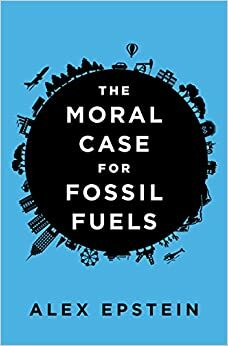 They give us life, as Alex Epstein shows in his new book, The Moral Case for Fossil Fuels. Based on meticulous research and backed up with solid facts, Epstein makes the case that fossil fuels—coal, oil, and natural gas—have tremendous positive impact on human life. Since the Industrial Revolution, the world human life expectancy has doubled, thanks to the fossil fuels. Fossil fuels are powering agriculture, through machinery and fertilizers, multiplying food production. Fossil fuels are powering industrial factories that produce goods that make our lives better. Fossil fuels are powering hospitals, medical clinics, and pharmaceutical production. Fossil fuels are powering refrigeration, making possible food transportation and storage. Fossil fuels are powering sanitation systems that help make drinking water safe and prevent disease. Fossil fuels are powering printing presses, schools, and libraries, making possible education and the rise out of poverty in many parts of the world. Yet, the environmentalists have duped us into thinking that our use of the fossil fuels is destroying the planet and our ability to survive. This mistaken belief is widely spread, even (or perhaps particularly) among those with university education. My undergraduate students were given the task to provide a moral defense for the oil sands industry, along with the first chapter of The Moral Case for Fossil Fuels (released pre-publication). The students argued, correctly, that the fossil fuels are good for us—until we can figure out how to better exploit renewable sources of energy, such as solar and wind. Had the students had Epstein’s entire book, they would have learned that solar and wind are intermittent and unreliable sources of energy, needing to be supplemented with constant, reliable sources, such as fossil fuels. As Epstein shows, since the Industrial Revolution, CO2 in the atmosphere has increased from .03 percent to .04 percent, and temperatures have increased by less than one degree Celsius, creating the entirely benign greenhouse effect. The greenhouse effect has improved crop yields and made climate more liveable, particularly in the northern hemisphere. Contrary to the environmentalists’ claims, catastrophic weather events and disasters: droughts, floods, storms, have not increased—but our ability to deal with them has, thanks to fossil fuels. Contrary to the environmentalists’ claims, pollution has not increased but decreased, thanks to fossil-fuel empowered technology. Contrary to the environmentalists’ claims (remember Al Gore’s movie An Inconvenient Truth and its outlandish predictions of 20-foot rise in sea levels? ), the sea levels have not, on average, increased. I could go on about all the positives of the fossil fuels that Alex Epstein describes in his book. However, he does it so well and with such an engaging style, that you would be better off by getting hold of a copy of this important book and read it for yourself (click here for Amazon.com). This would help you appreciate and support the work of fossil fuel companies that make the world and our lives better and reject the environmentalists’ destructive arguments. Having just finished reading The Moral Case for Fossil Fuels, I will enjoy the rest of my vacation with the reassuring knowledge that fossil fuels are powering Kauai’s electricity, sanitation, and transportation, making people’s lives and my vacation here safe and comfortable.